Bright and early on Saturday 1st December, the 16 runners in the selected Blues cross-country teams and a full bus load of supporters left Cambridge to travel down to Wimbledon common and the Headquarters of the Thames Hare and Hounds club, who kindly organise the Blues match every year. The atmosphere on the bus was lively, and we were all occupied with singing, dodging Ollies camera and laughing over the “unofficial programmes” (containing some true literary masterpieces in the form of athlete profiles from both Cambridge and Oxford teams), however we knew there was a job to be done. With Cambridge currently 3-2 down after the results of the Varsity II-IV’s fixture last weekend, we had to win both team races to bring the victory home. With strong line-ups from both sides it would take a big performance from all those running. The Ladies’ Race was set underway by the esteemed Varsity runner Ellen Leggate, who ran for both OUCC and CUHH over her career and holds the record number of appearances at 8 (more to come on appearance records later). 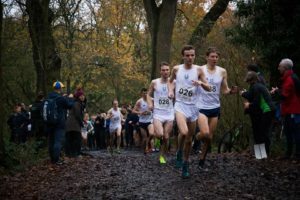 The Cambridge team were looking to put an end to Oxford’s winning streak from the last few years, and were suggested as narrow pre-race favourites, despite having a less experienced team (with only two returning Blues runners). Knowledge of the course can help, with a number of unusual sections along the way, but the team all negotiated the river crossing, the twisty turny sections through the woods and the rolling “Butts” (yes they’re actually called that!) with style, putting in some impressive performances. 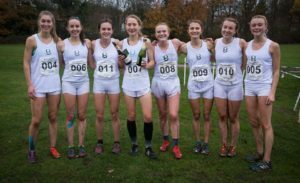 An initial pack containing Nancy Scott, Phoebe Barker and Oxford runners Charlotte Dannatt and Alex Shipley, looked to have made a break in the early stages, but were being strongly chased by Cambridge captain Niamh Bridson Hubbard, Fiona Bunn (CUHH) and Eleanor Bolton (OUCC). The Cambridge supporters seemed to have infiltrated even the furthest corners of the course, providing continuous encouragement to the whole team and lifting them to the finish. And oh what a finish it was. Neck and neck for almost 4 miles, the two flying second years Charlotte Dannatt (OUCC) and Nancy Scott (last years 4th and 5th finishers respectively) emerged from the woods together. It was then a burn-up for the final 800m across the now very slippery playing fields into the finish, won, to our delight, by Nancy! Behind, the chase had intensified and Cambridge had come through well, with captain Niamh completing the podium to finish in 3rd, fresher Phoebe making an incredible comeback from a broken foot just 4 weeks ago to finish 4th, Fiona Bunn making amends for injury last year in 5th and Lauren Major battling to come out on top in a tight sprint finish to take 7th (with 3 Oxford runners in 7 seconds behind her). 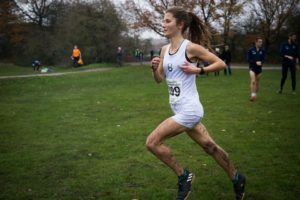 Next up were the two Americans on the team Julia Maxwell and Emily Sundquist, finishing almost in unison in 13th and 14th having overcome the mud of a British cross-country race together, and second year Flo Wiggins in 15th ensuring all of Cambridge were in before Oxford. It was then a nervous wait to find out the team scores, as we were all too tired to do the mental maths, but too our relief Cambridge were victorious with 33 points to Oxford’s 46. After another short wait (due to some technical issues with the uncorking) the Cava was sprayed and all attention was then on the Mens’ race. 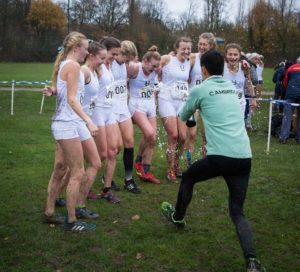 Unlike the Ladies’ race, Oxford’s starting line-up was favoured over Cambridge for the win, not helped by our loss of Ollie Fox to the GB team racing in the European cross-country championships next weekend. Everything was riding on this final race. We put forward an experienced team, 6 of which had run previously in a Blues race, and none more experienced than Will Ryle-Hodges who set a new record by just turning up on the day (Eight appearances – beating the previous record of 7 held jointly with Nick Talbot (1996-2002) and Warwick Ewers (1971-1977)). The race went out at a steadier pace than most years and initially the pack stayed together, suspense slowly rising. Over the intermediate few miles however, the race was blown apart. 4th year medic George Gathercole was Cambridge’s only survivor in the leading pack, alongside 3 Oxford runners. Will Ryle Hodges was hot in pursuit, but more Oxford runners were packing behind, in front of our next scorers. 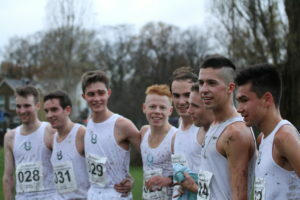 Overall it was a fantastic day that really highlighted the impressive standard of Oxbridge distance running at the moment (as well as marking the re-appearance of Chuggs bunny our famous mascot to supplement the support crew)! Congratulations to both teams for their displays of grit and determination, both in victory and defeat. Neither team gave up their fight until they had crossed the finish line, and both the runners and supporters deserved their time at the after-party (nothing on that here: what goes on at the after-party stays at the after-party 😉). 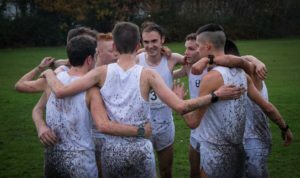 We’ve got to hand the overall win to Oxford, but with the strength in depth shown from both teams, and our victory in the Ladies’, we are optimistic for a very strong team result at BUCS in February. It’s back to the grindstone (after a bit of rest and recovery of course!). Thanks must go to our amazing Club captain Su-Min, and Womens captain Niamh, and to all those at Thames Hare and Hounds who helped to organise and marshall the race.